Networking group for Women in Design called BiTTT. Bring it To The Table, developed by Lana Lawrence of Anthony Lawrence-Belfair, provides its members with a place to share resources, experience and make meaningful connections in the design industry. 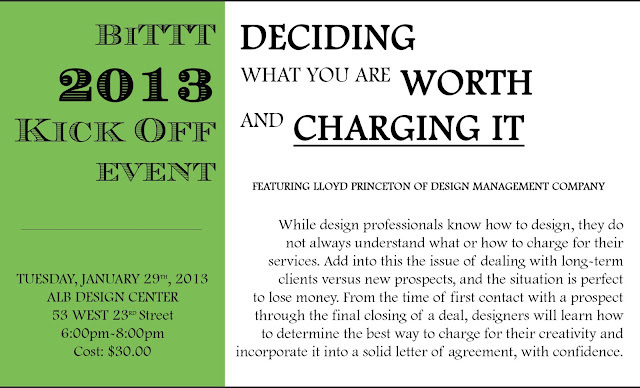 On Tuesday January 29th, BiTTT is hosting a lecture with guest speaker Lloyd Princeton of Design Management Company, an Agent/Expert for Architects and Designers. He will educate designers on "how to determine the best way to charge for their design services and incorporate it into a solid letter of agreement, with confidence." As an architect/designer myself, this lecture sounds very rewarding!